A former business leader who knocked a teenager off his bike and left him for dead has been jailed for three years. Owen Finn, 64, a former president of Hull and Humber Chamber of Commerce, left Kiernan Roberts, 16, in the middle of an East Yorkshire road last October. Kiernan suffered a broken neck and brain injury, and needs 24-hour care. Finn, who admitted a number of driving offences including drink-driving, was banned from driving for 11 years at Hull Crown Court. Finn, of Solihull Lane, Hall Green, Birmingham, pleaded guilty to causing serious injuries by dangerous driving; failing to stop after an accident; failing to report an accident; and driving above the legal alcohol limit. The court heard that Kiernan was cycling home on Brantingham Road, Elloughton, when Finn "ploughed" into him on the night of 7 October. 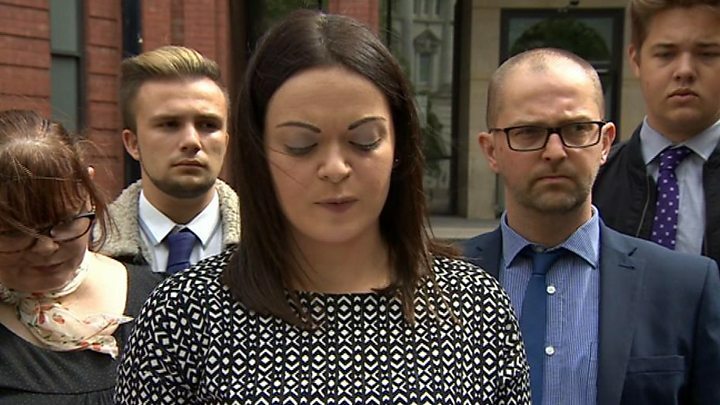 Instead of stopping at the scene, Finn, who was described in court as a successful businessman, drove 130 miles to his mother's home in Birmingham with a smashed windscreen. Kiernan, who was recently discharged from hospital, had to have a part of his skull removed and is now unable to walk. 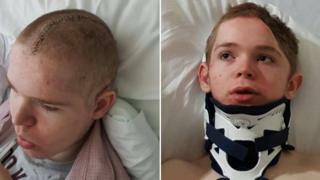 Image caption Left: Kiernan had to have a part of his skull removed during surgery and now needs 24-hour care; Right: the teen before he was "left fighting for his life"
Sentencing Finn, Judge Jeremy Richardson QC said: "This is an exceptionally serious case. It reveals the utterly dreadful consequences of drinking and driving. "Your behaviour that night was shameful in the extreme. "Your cowardice after the collision was breathtaking in its callous disregard for the life of the boy who you maimed, leaving him, as you did, in the roadway whilst you made off in an endeavour to evade justice. "All the very positive features of your life up to that point have been eradicated by your own truly dreadful behaviour." Speaking outside court, Kiernan's sister Katrina McLane said: "Our family has been torn apart and laid bare," she said. "Never did we contemplate his life and ours being so completely and irreversibly shattered in an instant." Gary Bell QC, defending, said Finn was a broken man who felt "genuine remorse".